If there is one thing that can’t be more frustrating it is going forward with your home purchase and sabotaging yourself when you get to the application and having you credit run. There are many things you can do without knowing that can negatively affect your status as a borrower with a lending institution, and hopefully as we go over 4 Mortgage Application Mistakes you won’t make the mistakes a lot of others do. We will go into details over the next 4 reasons that hopefully you can put to good use and ensure that you put your best foot forward when trying to purchase a home. It doesn’t matter what loan program you are trying to get approved under as there is always ways you can get yourself a denial without knowing. Some of these items may seem like common sense, but honestly these things happen and can happen to the best of them. If just one person can take the advice and prevent a loan denial, then we have done our job in informing the public on the mortgage decisions. If there is an easy way for you get a loan denial or at the very least cause your loan to stall, it is changing or quitting your job before you have signed on the dotted line. As with most loan applications and programs, there is going to be a need to show at least 12 months of work history and normally the previous 2 years or 24 months will be evaluated. What underwriters are looking for is a showing of consistency and jobs within the same industry or profession if you were to changes jobs. It may look risky if you change jobs frequently or have recently changed industries or occupations from what you normally do. Now this doesn’t mean you can’t change jobs before you close on your loan, but if you do change jobs and stay in the same profession then an offer letter from the new employer should put the underwriters at ease. However, there still may need to be 30 days of paystubs before you will be allowed to close your loan. The advice here would be if you are looking to change jobs, you should stay where you are at for the time being and put off your new job until after you close. This will prevent a lot of hassles and headaches in your loan closing process. Another of the 4 Mortgage Application Mistakes is not having an accurate visual of what your credit report looks like. One of the main reasons for mortgage denials is a low credit score, derogatory items on your credit report, or mandatory waiting periods not followed on the credit report. What I mean by this is you can get an FHA Loan after a Chapter 7 Bankruptcy, but you need to ensure you have waited the mandatory 2 years from the discharge date of the Bankruptcy. If it has only been 1 years since your discharge, there is no way you are going to get approved for an FHA Loan. With all of the free resources out there for you to pull your credit reports and evaluate what is on there, there should not be an excuse to be caught off-guard when our credit is pulled and if that results in a denial. Being informed on your credit profile is key if you want to ensure you are going to get a mortgage approval. Free resources need to be utilized in any way you can because it can only benefit you and not force you to change your plans. If you thought you were going to purchase a home and now have to wait 3, 6, or even 12 months before you can apply, then this can have consequences to your everyday life. If you do use these resources and see that there are mistakes on your credit report then you will need to contact the bureaus and make sure that they fix any and all mistakes that are visible. This might seem like an easy concept to get done before your loan, but you’d be surprised by the amount of people who have no idea what exactly is on their credit report. If you have ever gone through the mortgage process or are new to this arena, the one main thing you can do to jeopardize your loan application is to open up new credit lines before you loan closes. What you have to make sure you do is not let the excitement of owning a home cloud your judgment when it comes to spending. Before you sign on the dotted line, there will be a soft-pull of your credit where underwriters will be looking exactly for new lines that were not there on your original credit pull a few weeks prior. This can affect your loan approval because if by chance your debt-to-income ratio was on the borderline, this new credit card and debt can actually kick you over the threshold and you will get a last minute denial or be forced to wait to close. Another thing you can do to jeopardize your approval is to make big purchases over $400. With items this large or even larger, it raises questions from underwriters and they will want these purchases sourced and verified as to why they were needed in the first place, especially if there isn’t a history of them in your bank statements. Do yourself a favor, wait for your loan to close and then go out and buy your furnishings, furniture, appliances, etc. or you too will need to deal with a loan denial. If there is one thing that you might not think will have an affect on your mortgage application it is the timeliness of which you get your information into your loan officer and underwriters. Normally a loan application is carried out with importance and documents need to be supplied and returned as soon as possible. If you have a contract to purchase a house, it is just easier to be ready for your closing date then to drag your feet and be forced to ask for an extension to a later closing date. There are no positives in dragging out the time it takes for your loan to close. Most lenders want to make sure they get their loan closed as soon as possible and without delays. Here at Loan Consultants, it is in ours and the borrower’s best interests to get loans approved and processed as quickly as possible. The last thing we want to do is hold up a loan, and we ask for the same from our borrowers. If you work diligently with us, we will deliver for you. 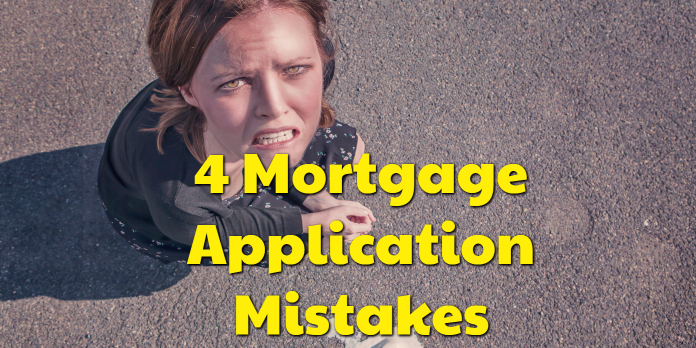 If you take these 4 Mortgage Application Mistakes to heart and prepare for these scenarios, you will ensure that your loan closes on time and that you are ready to become a homeowner. The worst feeling you can have is being caught off-guard by an underwriter who has to let you down that your application will be denied. Let’s all work together to make sure you are in the right place to get an approval. If you want to start planning for that day as a perspective borrower, please give me a call at 888-900-1020 and we can get your loan started today!